This past Friday I participated in a concert at George Washington University’s Lisner Auditorium honoring the recipients of the 2013 National Endowment for the Arts National Heritage Fellowship. David Ivey, Sacred Harp Musical Heritage Association secretary and Camp Fasola co-founder, was among the awardees. I joined a group of twenty-five twenty-seven Sacred Harp singers, mostly from Alabama and Georgia, who opened the concert singing four songs: “Idumea” (p. 47b in The Sacred Harp), “Florida” (p. 203), “Christian’s Farewell” (p. 347), and “Wayfaring Stranger” (p. 457). 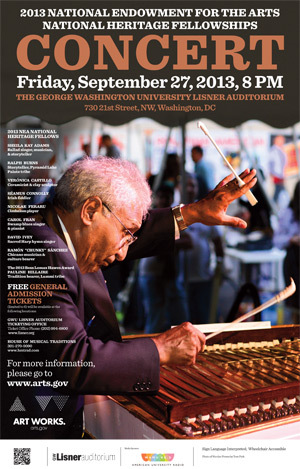 A videorecording of the 2013 NEA National Heritage Fellowships concert is available on the NEA website. Update: Will Fitzgerald requested a list of the singers who participated in the concert. Twenty-two Sacred Harp singers who had traveled to Washington D.C. to sing were joined by a pair of representatives from the Alabama Center for Traditional Culture (a group that has supported Camp Fasola and other Sacred Harp singing initiatives in Alabama for years), another NEA National Heritage Fellow with shape-note singing experience and her friend, and a member of the team that helped organize the event. Any chance you’d put up a list of the 25 singers? I’ve just updated the post with a list of the singers who participated. Turns out there were twenty-seven.